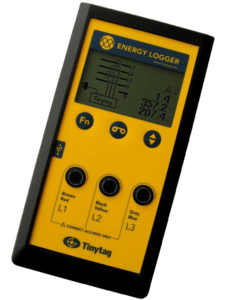 The Tinytag Energy Logger is a safe and easy to use device for monitoring single and three phase power usage in high consumption facilities.The handheld logger may be used for spot checks or for longer term recording. It uses non-invasive flexible coils to monitor the current in each phase of a three phase supply, while voltage information may be obtained via a standard 13A wall socket. We have a number of interesting short case studies which detail how some of our customers are actively employing the Energy Logger to help assess energy usage, reduce consumption and save money. Please see below for details. The Energy Logger records data which is downloaded to a PC to help identify times of peak load and to identify power hungry or inefficient equipment. The unit also records 'Power Factor' (PF) data, a measure of power transmission efficiency: this can be significant because power companies typically charge a higher rate for industrial or commercial customers with a low PF. Energy monitoring and careful analysis of results can lead to specific, straightforward and practical ways of cutting energy consumption and meeting environmental management targets.